If you have a Wufoo contact form and a Salesforce account, you can use our Salesforce integration to link the two together. This means that when your contact info is collected through the Wufoo form, a new contact is automatically added to your Salesforce email list. Now you can use Wufoo's professionally designed form templates with your favorite mailing list provider. No need to export and import manually every time you want to send out a newsletter, we'll do everything for you automatically and in real time. 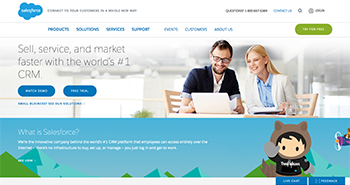 Salesforce is a software as a service (SaaS) company that distributes business software on a subscription basis. It is best known for its Customer Relationship Management (CRM) products that allow you to mind your customers and your budget at the same time.